A Spa Quality Foot Washer. Get Feet Clean Fast & Easy! Soapy Soles are the easiest and most convenient way to wash your feet. No more bending over, slipping, falling or straining. This simple little device allows you to get your feet super clean quickly and easily. It is a foot-shaped pad that suctions to your tub or shower floor to provide a soft bristled surface for cleaning and invigorating your feet. 1500 little fingers massage your feet, deep cleaning and removing dirt. Your feet will be left incredibly clean and invigorated in very little time, and without any bending or struggling. The Soapy Soles Foot Washer has a cobalt blue foot pad that attaches using 31 powerful suction cups to keep it firmly in place. Just attach to the floor of your tub and you are good to go. It is ideal for fall prevention in the shower when trying to wash your feet, making it great for the elderly, people with disabilities, children, folk with arthritis and more. Simply wet it, apply a dab of your favorite liquid soap, and rub your foot back and forth for a thorough, soothing foot wash. A thick lather will build up quickly to thoroughly cleanse your feet with ease. This great scrubber does all the work so your don't have to. It all but eliminates awkward bending & balancing while in the shower, and is a refreshing treat for tired feet. Soapy Soles makes a great addition to any tub or shower. The American Podiatric Medical Association recommends washing feet regularly, especially between the toes, to keep feet healthy. But for those with circulatory disorders or who have trouble bending over, keeping feet clean can be a real challenge. The Soapy Soles is perfect for these people. For the rest of us, it can save time and allow us to benefit from the therapeutic massage and the resulting, super clean feet. 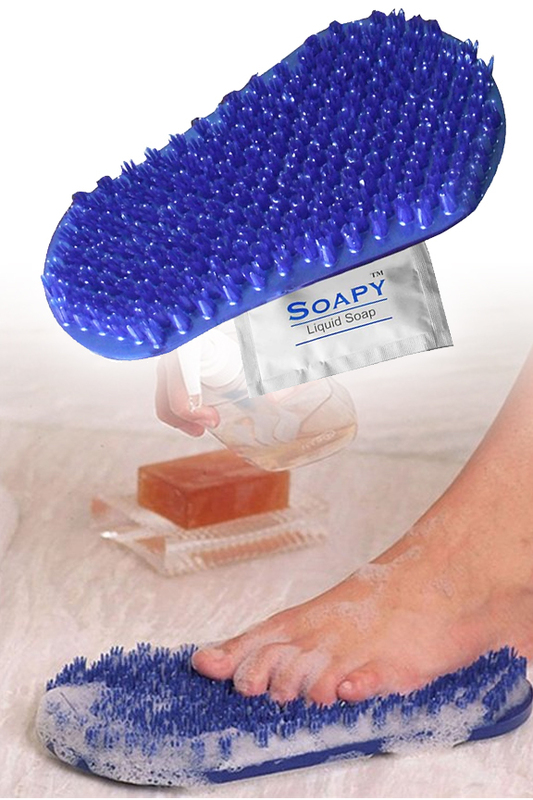 This hands-free foot scrubber has been designed to gently scrub and massage feet without bending. Powerful suction cups keep the PVC sole securely in place on the tub or shower floor while 1500 rounded fingertips provide gentle scrubbing action. Soapy Soles are great for camp or beach showers too. They make it easy to clean really dirty feet, and will easily remove sand, mud, caked on dirt and more. Stop hopping on one foot to wash the other. Clean your feet the easy way with this great product. Get Yours Today! Soapy Soles Original - The easiest way to wash your feet. Get a spa quality foot treatment right in your own shower. Great for elderly, people with arthritis, folks with disabilities, children, those with really dirty feet and more.Order Today! My husband is quite overweight and a diabetic. It is important he take good care of his feet. Soapy soles allow him to get a “good scrub” without hurting his feet. He doesn’t feel his feet so these scrubbers are gentle and get the job done. This is a great product. It sticks to my shower floor tiles perfectly allowing for a great foot scrub. Feels great on my feet and does a good job. Happy I got it. This plastic pad in the form of a foot with multiple soft plastic projections sooth and tickle the sole of your foot as you wash them in the shower. I ordered this knowing what I wanted because we left our last one on vacation by mistake. Inexpensive, arrived on time in good shape, I recommend the product and the company. This is my 3 soapy soles. I do not know what I have ever done with out them. I LOVE them. The soapy soles are nice but, I think something that also cleans the top of the foot would be better. Plus, something to smooth the heels. Cleaned, massage, and scratched real good! The Soapy Soles are wonderful! They have just enough strength to do a good scrubbing job and massage the bottom of your foot while you are taking your shower or bath. The grass like extensions on the soapy soles are strong enough to scrub well but not me in any way painful or do any scratching on your foot. I got extra so that I could have one in each bath/shower as well as in my kitchen sink to wash my hands really well and clean my fingernails before preparing food. FYI they're great for scrubbing potatoes! My 13 year old granddaughter recommend them especially for the fingernails! Got my first original Soapy Soles, and I LOVE IT! It makes me wonder how I got along without it for so long. It is both easy and effective. THIS IS A REPLACEMENT FOR 15 YEAR OLD SOAPY SOLES. I LOVE THEM TO CLEAN THE BOTTOM OF MY FEET SINCE I WALK AROUND BAREFOOTED MOST OF THE TIME. I ALSO ORDERED ONE FOR MY DAUGHTER-IN-LAW FOR HER BIRTHDAY. This product works great! I would recommend it. Love my soapy soles, no more bending over and being unbalanced trying to hold foot up to wash. They are soft but effective in cleaning feet. This is a great product. I am buying a second one for myself (for the cottage) and one for a friend. A really easy way to get "summer sandal" feet scrubbed clean. If one has difficulty bending low in the shower to scrub the soles of his or her feet- this is a great item. How wide&a how long ? It's about 11 1/2" long, and 5 1/2" wide. Will it stay on a non smooth shower floor surface? The multiple suction cups should prevent movement on almost any shower surface. Yes it will. The scrubbers are plenty long enough. Do it clean the top of your foot too. You can use it to clean the top, bottom or side of your foot, but it only cleans one side at a time. Two Great Body Washing Tools for One Low Price!